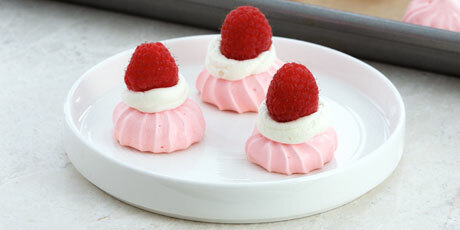 These little crisp meringue cookies are tender and light and a treat on their own or used to decorate a cake, but when each is topped with a little whipped cream and a fresh raspberry, they are fantastic dessert nibbles, ideal for afternoon tea or part of a petits fours plate. 1. Preheat the oven to 200 ºF (95 ºC) and line 2 baking trays with parchment paper. 2. Place the egg whites with the sugar and lemon juice in a metal bowl and whisk. Place the bowl over a pot filled with an inch (2.5 cm) of gently simmering water and whisk the whites constantly until they are warm to the touch (not a specific temperature, just warmer than body temperature.) Using electric beaters, or pouring the warmed whites into the bowl of a stand mixer fitted with the whip attachment, whip the whites on high speed until they are glossy and hold a stiff peak when the beaters are lifted, about 4 minutes. Use a toothpick to add a little pink colouring paste and stir in by hand. 3. Spoon the meringue into a large piping bag fitted with a medium star tip. Pipe a dot of meringue on the underside of each corner of the parchment paper (this will stick the parchment in place so that it doesn’t lift up as you pipe) and pipe little rosettes about an inch (2.5 cm) across onto the trays, leaving some space between them. Bake the meringues until they are dry, but do not brown at all, about 30 to 70- minutes (this wide timeframe really depends on the humidity of the day.) If you find that after cooling, the meringues are still soft, they can be returned to the oven. Cool the meringues on the baking tray. 1. To assemble the gems, whip the cream until it holds a soft peak and fold in the icing sugar and vanilla. Pipe a little cream on top of each meringue and top each with a single raspberry. Serve within 2 hours. The meringues can be made up to a week in advance and stored in an airtight container, but the assembled gems should be enjoyed very soon after being topped.